Kanzashi Japanese folded fabric flowers are a beautiful interpretation of fabric origami. Kanzashi are the decorative hair ornaments used in traditional Japanese hairstyles. Today, they are most often worn by brides and geisha participating in tea ceremonies. For geisha, the style and manner in which kanzashi are worn indicates status. Apprentice geisha wear more elaborate kanzashi than older geisha do, and they progress through several hairstyles where the kanzashi ornaments must be worn in a particular fixed pattern. Folded fabric flower kanzashi are just one type of this unique hair ornament. 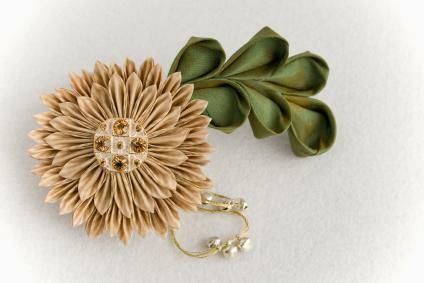 Kanzashi can be made from a wide range of materials, including tortoiseshell, wood, gold, silver, and plastic. Changes in the color and embellishments used on kanzashi indicate observance of special holidays and seasonal celebrations. It is interesting to note that some people collect kanzashi because of their unique beauty and historical significance within the Japanese culture. Kanzashi fabric flowers are traditionally made with hobotai silk to give them a brilliant color and rich texture. However, many modern American crafters have had success creating these pretty petals with cotton or synthetic fabrics. Beginning kanzashi makers will also want to consider that working with less expensive fabric scraps is probably the best way to keep the cost of their project low. It's not uncommon for your first few blooms to be unusable, so you don't want to risk wasting your expensive fabric until you've perfected your technique. Making pretty kanzashi flowers takes practice and patience. There are many different ways to make kanzashi flowers, depending upon the type of fabric you are using and what kind of flower you want to create. Some crafters like to make their flowers reinforced by sewing the petals together or gluing beads and buttons into the center of the blooms, while others stick to more standard fabric origami practices. Every origami crafter has a unique learning style. While some people have no trouble following along with photo tutorials, others prefer video instructions that demonstrate each step of the project. YouTube has several tutorial videos covering how to make kanzashi flowers. If you find yourself mesmerized by the beauty of Japanese folded fabric flowers, you may want to pick up a copy of Kanzashi in Bloom by Diane Gilleland. Kanzashi in Bloom strays a bit from the traditional kanzashi techniques to make creating fabric flowers easier for the novice. Several different designs are covered, however, as well as ideas for things you can make with your finished kanzashi Japanese folded fabric flowers. Ms. Gilleland is a crafter and writer of the daily blog and bi-weekly podcast, CraftyPod. Attach a flower to a pin and wear it as a brooch. Sew flowers to the bottom of a plain scarf or to the brim of a winter hat. Add a flower to gift instead of using a ribbon bow. Sew a flower to a pillow for a pretty, decorative accent. Arrange several flowers in a glass bowl for a cute centerpiece. Stitch flowers to a length of grosgrain ribbon to make a seasonal garland.